St. Tammany Parish Sheriff’s Office responded Tuesday (July 25, 2017) to a Slidell area woman's report about a man acting suspiciously and ended up arresting a man wanted for second-degree murder by the New Orleans Police Department. The caller reported that the suspect saw her leaving her home and starting walking away. After she drove away, the suspect walked back toward her home and she became concerned. The responding deputy located a man in the back seat of a vehicle at another residence. Upon questioning, the man provided several different fictitious names and the reason he gave for being in the neighborhood continued to change. 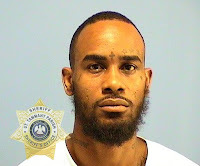 Ultimately, the man was identified as Roosevelt Rumbley (29) and that he was wanted by NOPD for a second-degree murder and wanted for probation violation.